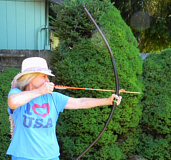 Selecting and arrow for your bow can be challenging, discouraging and totally a blow out for the beginner in archery. This page is going to help you to select the right arrow at the right price regardless of what stage of archery you find yourself. Maybe you bought one of my bows and received a target arrow with the bow. Beleive me all arrows are not equal. The arrow I sent, more than likely is not the best arrow on the market. I get cheap arrows so I can keep the price of my bows down. My goal is to make archery affordable and fun for everyone. However, now that you received your bow it is time to invest a little in a good arrow to practice with. If you happen to be an experienced achier then you might want to share some of your experience with selecting arrows. If so please email me with your suggestions about arrows. The video below is a video that might help you select the right arrow. Arrow weight is important and something you should think about when selecting an arrow to practice with. The following video will give you a brief idea about which size arrow might fit your needs. I hope this has helped. The price of arrows varies. i get my personal target arrows from Cabela's in Eugene, Oregon. I don't know if you have a Cabela's in your town but if you do they sell good carbon target arrows for about $5.00 a piece. This does not include the tips. I use a light weight target tip.